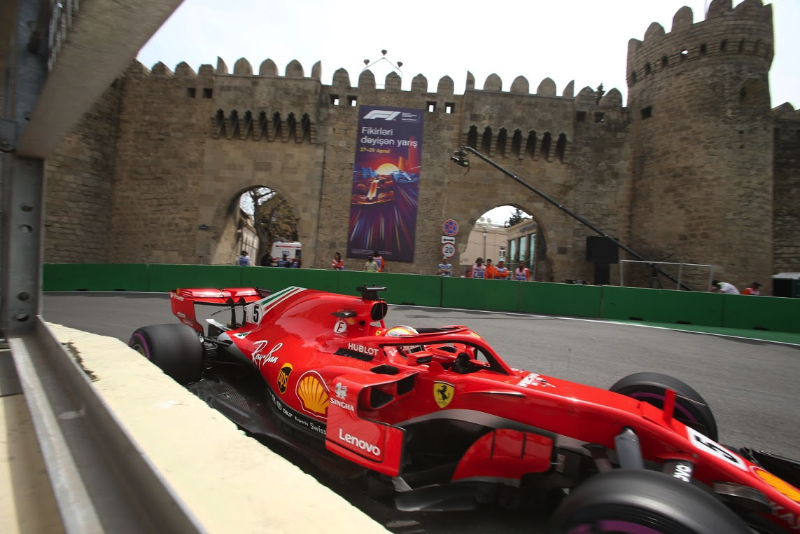 Sebastian Vettel was only 11th fastest at the end of practice on Friday, but the Ferrari driver bounced back on Saturday and went comfortably quickest in Free Practice 3 for the Azerbaijan Grand Prix. The line-up for the weekend was: Mercedes – Lewis Hamilton and Valtteri Bottas; Ferrari – Vettel and Kimi Raikkonen; Red Bull TAG Heuer – Daniel Ricciardo and Max Verstappen; Force India Mercedes – Sergio Perez and Esteban Ocon; Williams Mercedes –Lance Stroll and Sergey Sirotkin; McLaren Renault – Fernando Alonso and Stoffel Vandoorne; Renault – Nico Hulkenberg and Carlos Sainz; Toro Rosso Honda – Brendon Hartley and Pierre Gasly; Haas Ferrari – Romain Grosjean and Kevin Magnussen; Sauber Ferrari – Marcus Ericsson and Charles Leclerc. Ricciardo had been fastest in both sessions on Friday, topping things off with a time of 1:42.795. "I remember last year we were fast on Friday," he said after FP2. "I think we can find some more, but generally I was happy with the car. No big problems. I think it'll be a close battle Friday and Sunday. The only thing that changes is the wind, it gets quite strong at the weekend so that'll probably make all the cars feel a bit worse. But I think it's a good start." The McLaren drivers started things out in FP3. The ambient temperature at the start of the 60-minute session was 75 degrees Fahrenheit (24 degrees Centigrade) and the track temperature was 84 degrees Fahrenheit (29 degrees Centigrade). Vettel set the early pace on what was once again a greasy track with a time of 1:44.758 followed by a 1:43.642 and a 1:43.176 on the ultra softs. Raikkonen and Verstappen were second and third albeit 0.7 of a second slower. "It looks like the ultra soft should be the optimal qualifying tire, so everyone is trying it out during this session. Track is evolving quite quickly, but it is still quite slippery out there," Pirelli tweeted. Hartley, Grosjean and Stroll proved that by having to take the escape roads. As the midpoint of FP3 approached the top eight were: Vettel, Raikkonen, Verstappen, Hamilton, Stroll, Bottas, Magnussen and Alonso. But the drivers had yet to do their qualifying simulations. First among them to go for that qualifying lap was Perez who jumped up to third. Just over 20 minutes remained when Hamilton headed out on a new set of ultra softs. Bottas did the same. Hamilton clocked a 1:43.874 and Bottas a 1:43.569. Raikkonen turned a 1:43.493, which put him second. Then Vettel trimmed his time down to a 1:43.091. Hamilton moved up to third with a 1:43.553. Fast man Friday Ricciardo had yet to do a fast lap and was down in 12th. Then, with just over 10 minutes to go, Hamilton slotted into second with a time of 1:43.452. A couple minutes later Sirotkin hit the wall at Turn 3. That brought out the red flags and ruined the fast laps of several drivers. The order was: Vettel, Hamilton, Raikkonen, Bottas, Perez, Magnussen, Verstappen, Stroll, Ocon and the now crashed Sirotkin. Nine minutes remained but the clock continued to wind down. The session restarted with three minutes left. There was a flurry of activity and traffic during those final minutes as drivers tried to get in one fast lap. But that proved to be difficult, and when it was over the top 10 were: Vettel, Hamilton, Raikkonen, Verstappen, Bottas, Perez, Magnussen, Stroll, Ocon and Sirotkin.